This tutorial is going to cover shortly about running vagrant ssh on windows by different approaches. Probably, this will be useful when you want to use vagrant ssh command to ssh directly to your Vagrant box on Windows. The root cause could be because Vagrant could not found any SSH client in the Windows system path. Hence, in this article, we are going to get through both 2 approaches. Step 1. Download and install proper Git client for Windows from its website. If you already installed Git, move to the step 2. Step 2. Add the following paths in to the Windows system path. In Windows 7, right click on My Computer and select Properties > Advanced. 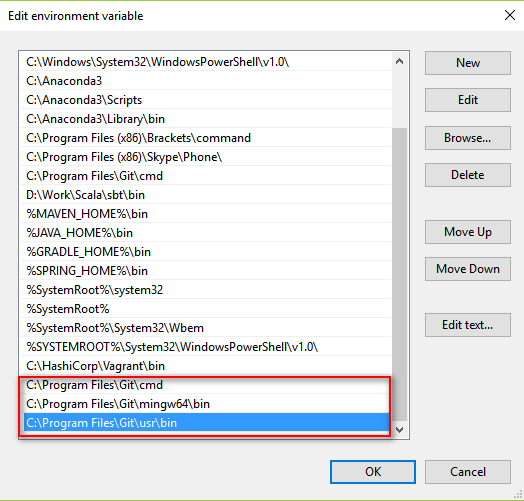 Select the Path variable and append the above Git paths to the Path variable. Here is an example on my Windows 10 machine. Another way is to use a SSH client to ssh to the Vagrant box from Windows. And as you may know that Putty is a very popular SSH client for Windows. You can download a version on the Putty website. After downloading, start Putty and review the recommendation of Vagrant again. Then you should be logged in successfully. The private key is located at the VM location. Here is an example on my machine. 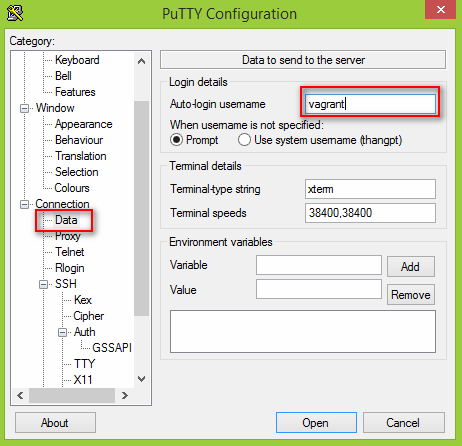 For this approach, you will have to download the PuTTYgen from the Putty website. Expand the Connection node –> expand SSH –> select the Auth node. Browse to the key we have just generated above by PuTTYgen. And click the Open button will get us logged in to the VM. We have just learned how to run vagrant ssh on Windows. Because there is no SSH client on Windows by default, Vagrant cannot find and invoke the ssh command accordingly. Thefore, to fix that, we have to install a favorite one by ourselves. We also got through 2 approaches including to install Git with extra configuration of the Path and to use the Putty. If anyone is using Git, this approach should be very easy while the Putty approach takes more effort.